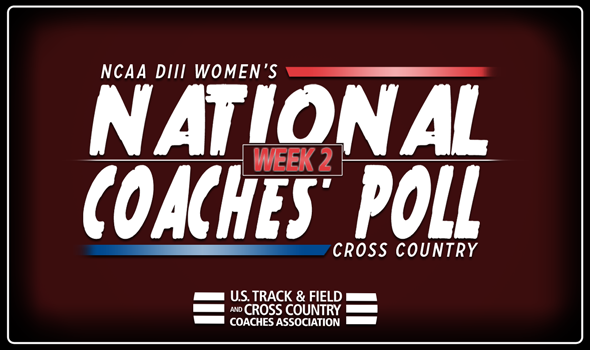 NEW ORLEANS – If Week 2 of the NCAA Division III Women’s Cross Country National Coaches’ Poll is any indication, we’re in for a treat the rest of the season. Twelve teams jumped three or more spots between Week 1 and Week 2, including two teams that vaulted into the top-10 for the first time this season. The top-3 teams in the National Coaches’ Poll remained the same: No. 1 Johns Hopkins, No. 2 Washington (Mo.) and No. 3 SUNY Geneseo. This marks the 12th consecutive week that the Blue Jays have been the top-ranked team in the nation. UW-La Crosse improved from No. 13 in Week 1 to No. 4 in Week 2, which matches its best ranking in program history. The Eagles flew in formation at the Augsburg Invitational as they finished runner-up to NCAA Division II Minnesota-Duluth and were the top-finishing NCAA DIII program at the meet, ahead of St. Olaf and St. Thomas (Minn.), among others. Hannah Beilke was the top finisher for UW-La Crosse as she took ninth overall. You don’t have to go down too much farther to find Hope. The Flying Dutch commandeered national attention and sailed from No. 23 to No. 7, one of the biggest jumps in the history of the National Coaches’ Poll. This is the best ranking in program history for Hope. The Flying Dutch dazzled at the Gil Dodds Invitational this past weekend, where they finished second as a team as Emily Hamilton led the way with a third-place individual finish. Pomona-Pitzer climbed 11 spots from Week 1 to Week 2. The Sagehens come in at No. 13 this week after a strong effort at the UCR Invitational. Pomona-Pitzer was the top-finishing NCAA team in the non-invitational race, besting several other NCAA DIII programs. Calvin moved up five spots from No. 19 to No. 14 after finishing eighth at the Spartan Invitational hosted by Michigan State. Katie Diekema led the Knights’ charge as she finished 13th individually in a time of 22:53 on the 6K tract. Case Western Reserve went from the Land of the Unranked to No. 24 this week. The Spartans proved their might this past weekend at the Allegheny Classic with a runner-up finish behind meet champion Carnegie Mellon. Individual runner-up Madeline Lindemann was the top finisher for CWRU. Three other teams joined the top-35 this week: North Central (Ill.), St. Olaf and Swarthmore. This is the first time that both the Cardinals and the Garnet have been ranked in the National Coaches’ Poll since 2015. Be sure to check back throughout the season as a lot will change between now and November 17, when the 2018 NCAA Division III Cross Country Championships will take place in Oshkosh, Wisconsin.